What I’m cooking: The intestinal organs (intestines, stomach, pancreas and liver) are all moving to where they’re meant to be, and baby is putting on some serious weight! From 14g last week, we’re nearly double that this week at 23g! 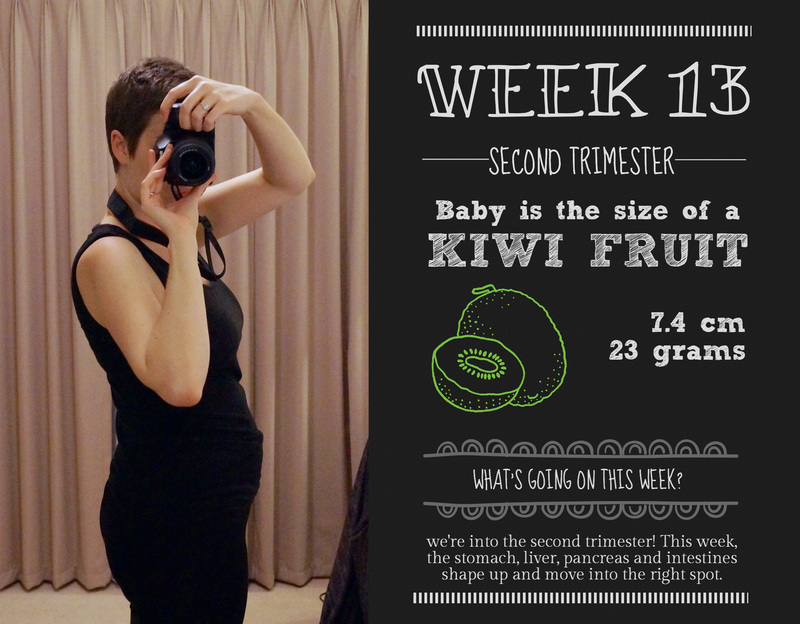 What’s on this week: Trimester 2! Enter the “easy” trimester! I’m so excited to have finally reached this milestone, as the chance of things going wrong is properly tiny now. Perhaps I can relax now… Also, our first hospital appointment is on Friday, I have no idea what to expect, but I’m looking forward to getting a bit of a rundown on how the hospital works at labour time, if I can have a tour, when I start prenatal classes. So much happening! Last week was lovely and uneventful, especially since my energy levels seem to be returning to human levels, rather than sloth. I even got to baking on the weekend, making a peel-free marmalade for Mr Nester (I can’t stand the stuff! ), two lasagnes (one for a friend who just had a baby), and a big Thai chicken noodle dish. Yum! I also managed to do some shopping, and bought my first real maternity clothes – jeans! And oh GOD are they comfy! That’s all I’m going to be wearing for the next, oooh, 2 years? So nice to wear something that fits. Last week I made the huge mistake of trying to wear an old skirt to work, with tights. Within half an hour I was in uncomfortable agony, by the end of the day I’d undone the back of the skirt so I could, you know, breathe. Apparently my waist isn’t as waspish as it never was! On another, sort of parallel note, I’ve started reading some new books this week. I’ve mentioned Baby on Board before, but let me say it again: this book is goooooood! It’s so nice to read a parenting book that doesn’t scold or condescend, and actually gives you background to the recommendations. A few million years of background, to be exact. I’m currently reading about the evolution of the human body to be able to give birth to more intelligent, and therefore larger headed babies, and all the knock on effects this had. Absolutely fascinating, and really well written. My other new read is Expecting Better, written by an economist who, instead of accepting verbatim the (often vague and extremely restrictive) guidelines given to her in pregnancy, decided to do the research herself. She talks through the reasons why certain foods are given the blanket ban, and highlights the issues with the studies and the conclusions drawn. It’s, again, fascinating, and refreshing to hear an alternative perspective. Some of her adjustments I’ll probably leave (she concludes that 2-3 alcoholic drinks won’t do any damage) – although her analysis is sound, there’s always an exception, and I don’t need to drink. Poached eggs, on the other hand, are back on the menu! And I feel far better about drinking coffee as well. It’s really nice to have some pressure taken off. Well, I think I’ve rambled for long enough, I’ll leave you be on your (assumed fantastic) Monday.